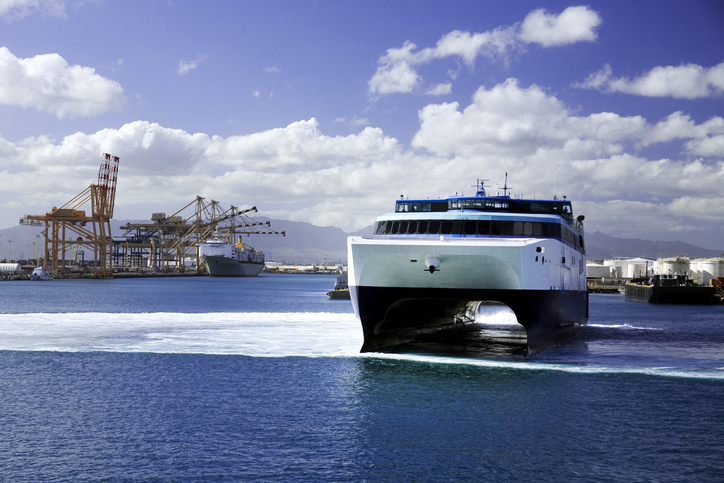 What ferries currently run between Hawaiian Islands? Believe it or not, traveling from one Island to the other in Hawaii is pretty difficult. For the most part, you need to take a flight to get from one island to another currently. This was not always the case though. Hawaii had a ferry that brought people from one island to another which operated for a few years about ten years ago. Unfortunately, legal troubles as well as financial issues caused the Hawaiian Super Ferry to cease operations in 2009. There currently is limited Ferry service between some islands, but it does not include the option to take your car with you. Right now, the only way to get your car from one island to another is to ship it. The problem with that is that many car shipping companies do not have the option for inter-island car shipping in Hawaii. Ferries were a big mode of transportation in Hawaii in the nineteenth century up until the 1950s. Since then there were a couple of attempts at re-establishing Ferry service in Hawaii, but they all unfortunately failed. Then, in 2001 planning for the Superferry started. In mid-2004 construction on the first Superferry started. In late 2007, the Superferry took its very first voyage. The first trip was smooth but was met with resistance from many protesters. These people were protesting the potential environmental effects the massive ship could have. The protesters went as far as forming a human chain on surfboards in front of the ferry at one point. The ship is three hundred and fifty and feet long and stands five stories above sea level. It weighed almost nine hundred tons. It could carry almost nine hundred passengers and nearly three hundred cars. The issue is that such a big ship moving through the shallower waters when docking near each island, could have decimated the local ocean ecosystem. It could easily have crushed and killed oceanic wildlife such as whales and dolphins. The Superferry was incredibly inefficient too. It used fifteen times the amount of fuel that a plane would have in order to travel the same distance. The Superferry also took six times longer to travel the same distance as said plane. Initially, the ferry was allowed to operate without providing an environmental impact statement. That is how it was able to operate on and off for nearly two years. However, Hawaii’s Supreme Court quickly ruled unanimously that the environmental impact statement was required. The ferry service was soon after suspended in 2007 due to that supreme court decision, mounting protests and overall environmental concerns. After more back and forth legal proceedings, the Superferry was once again allowed to resume service later that year. A year later in 2008, the ferry company and the environmental group returned to court on an appeal of the decision to allow the ferry to operate while the environmental study was being done. In 2009 the court ruled that it was in violation of the constitution for the Superferry to do so. The Superferry immediately suspended service and let go all of its employees. Two months later the company filed for bankruptcy. It then announced it would abandon both of its ships. This was the official end of the Hawaiian Superferry. The ships were both bought by the US Navy for a fraction of what it cost to build them. The Navy then leased the larger ship to Bay Ferries in Canada where the ship will once again operate as a Ferry between Maine and Nova Scotia, Canada. In the years since the Superferry ceased operations in Hawaii there have been several revival attempts. All have failed so far. However, the discussion is on-going. Environmental concerns still play a major role in these decisions as do projections for ridership which are still not high enough to justify a new ferry. Although, these projections do not include tourists yet. Right now, there are only ferries that run between Maui and Lanai. You can book these trips here. That’s it as far as ferries in Hawaii at the moment. If you want to travel from one island to another in Hawaii in any other combination than Maui and Lanai, you will need to take a short flight. You can see the full list of flights you can take to other islands here. It is obviously not easy getting from one island to another in Hawaii. Even when the Superferry did exist, there were lots of delays and it would sometimes take longer than a flight would. There isn’t anything to suggest that a new ferry will pop up anytime soon, but it is still not out of the realm of possibility.